MINNEAPOLIS—Mere minutes after rejecting a Home Depot employee’s offer of assistance with a curt shake of his head and the phrase “No thanks,” local man Garrett Hoffman, 44, reportedly came crawling back for help Monday. 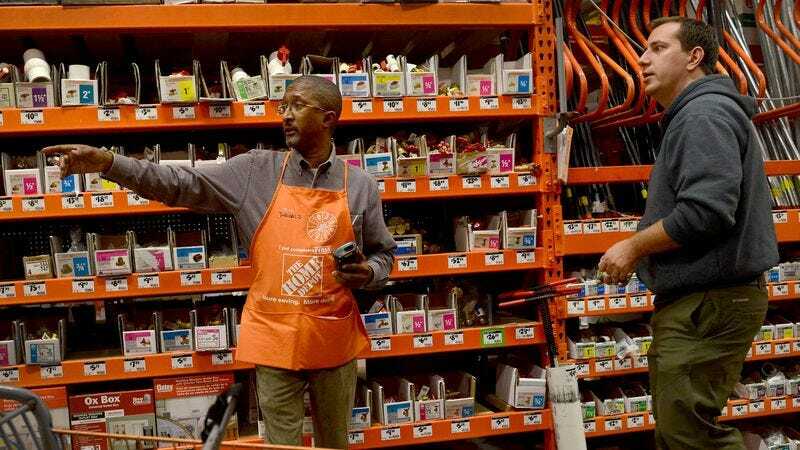 “Excuse me, I’m looking for foam sealant,” said Hoffman, returning with his tail between his legs to the very same salesman he had just moments earlier arrogantly brushed aside as he strode with unfounded confidence down the plumbing aisle. “I looked next to the fiberglass insulation but didn’t see it there, and it wasn’t by the other spray products, either. Maybe it’s in the back?” At press time, the once cocksure customer was barely able to raise his head to look the floor salesman in the eye as he returned a second time to meekly request help getting the sanded plywood down from the top shelf.